A fantastic article on what people in their 40's and above would advise their 30 selfs if they had a second chance. Two wonderful workshops are happening this March 2014 - 15th (Satuday) and 16th (Sunday). This is in Mumbai at Malad. Before we come to the topics, this is for those seekers who truly want to get deeper answers to one's life and know about themselves more. If you aren't one of these, not to worry, please visit Disneyland. For those interested, you know how to get in touch with me. How to relax and respond positively in stressful situations? How is disease created and how can it be healed? How to break negative thought patterns and become more positive? 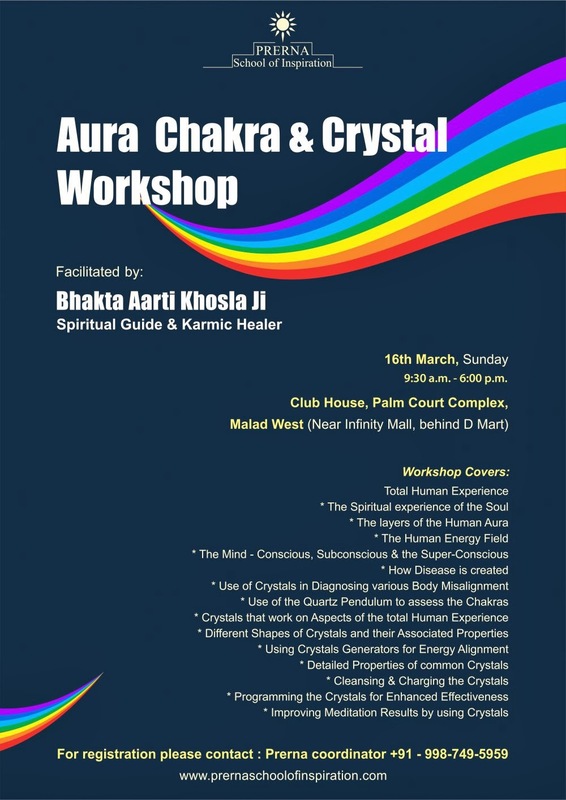 Auras Chakras and Crystals Workshop - 16th Mar Sun 9:30 a.m. to 6:00 p.m.
A multi-faceted personality, Bhakta Aarti Khosla is a Karmic Healer and a Spiritual Guide.Being Clairvoyant and Clairaudient since childhood, she has been guided by her Gurus and Spiritual Guides to uplift positive and healing energies in all living beings. She is the founder of Prerna School of Inspiration, an NGO in Chattarpur, New Delhi, facilitating Literacy Programmes along with the provision of Medical assistance and surgeries for under-privileged children. Other activities include regular Unn Daan Seva or offering food to those who are unable to receive even one meal a day . Bhakta Aartiji leads a team of Prerna inspired volunteers, therapists and trainers dedicated to the cause of 'Sharing the Light' with people from all walks of life. 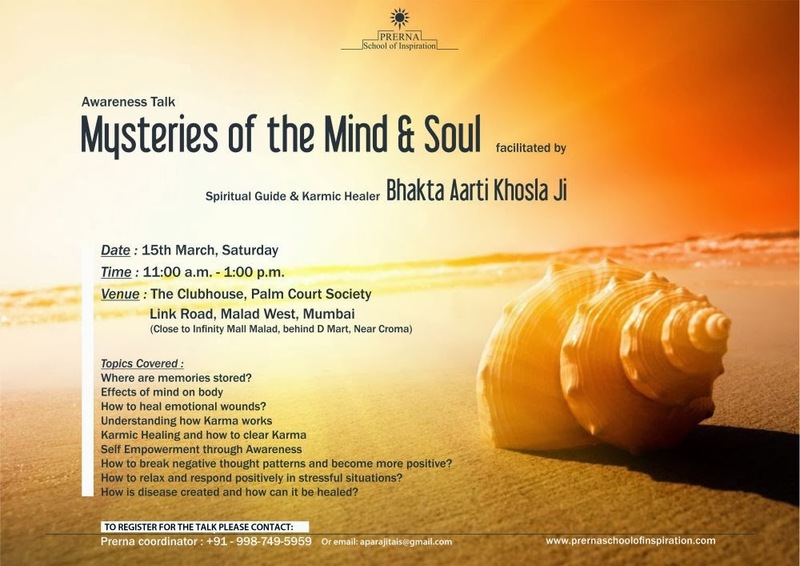 Temple of Inspiration is a center where Bhakta Aarti Khosla holds regular lectures and workshops connecting the intellect and spirituality with the purpose of “Empowering and Awakening the consciousness”. She has conducted several workshops, in India and internationally on ‘Mind Therapies’, addressing specifically the linkage between Karma, Mind and the Spirit. She has also initiated the‘Inspiring Mankind’ series of workshops which are focused on awakening the potential of the mind and dispelling fear. With her guidance, many have learnt to live a karmically positive and inspired life.